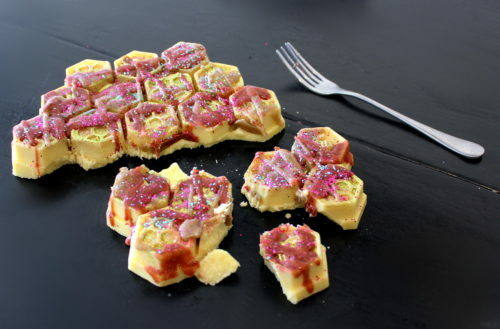 Designed to look like candy bark, these homemade bath melts are made with real honey and cocoa butter for a lush bath experience! These are perfect for when you need to take some time out for much needed self care. 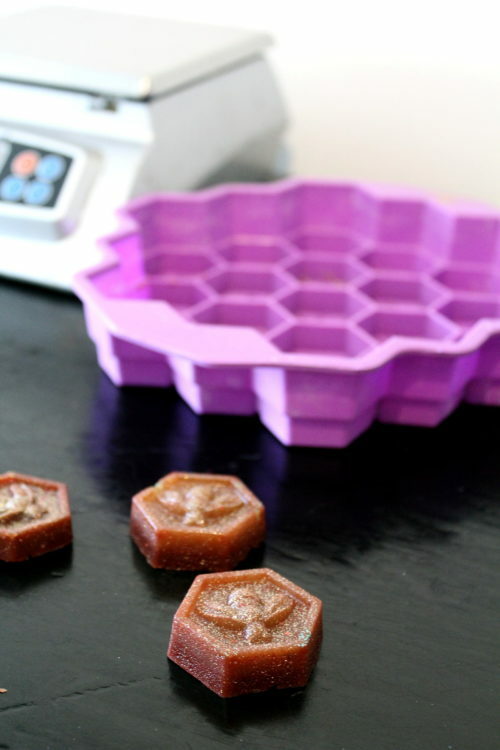 Or make and give these cocoa butter & honey homemade bath melts as unique homemade gifts throughout the year. Should glitter vex you, don’t worry. It’s easy to avoid. 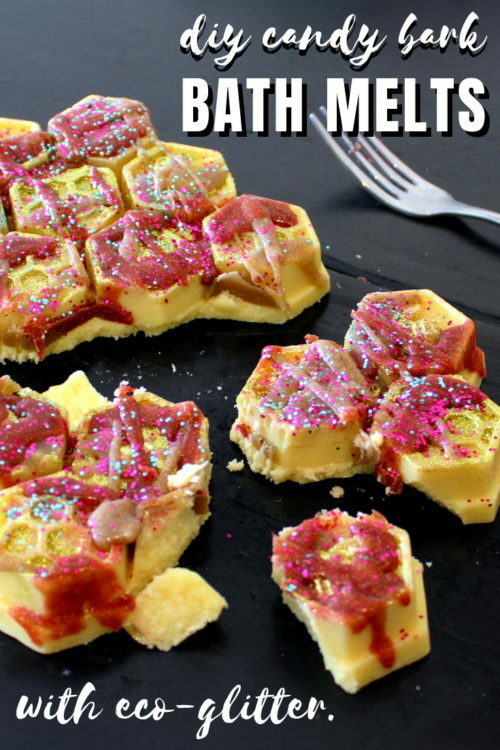 You can use real candy sprinkles for the “sparkle” on these homemade bath melts in its place. Alternately, if you have concerns about the environment, be sure to use eco-friendly biodegradable glitter. It’s what I used for this project. After all, there’s more than enough plastic floating around in the ocean. Continuous remnants of glitter aside, I did run into a few snags when creating my DIY candy bark homemade bath melts. Initially I ran into issues due to the mold design. 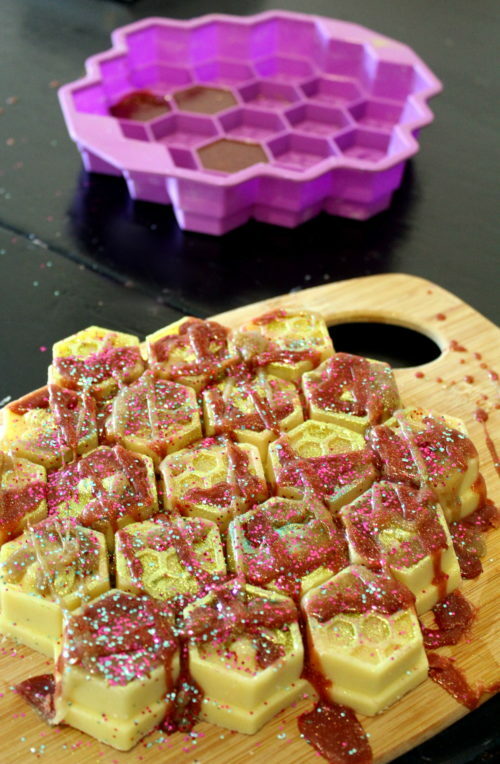 I chose this silicone bee mold for this DIY because I thought it would make my homemade bath melts look like candy bark. However, I had to use more ingredients in particular this mold than I’d originally anticipated. The reason? I just couldn’t get my homemade bath melts out of the mold in one piece. I wasn’t ready to give up on my idea of making my homemade bath melts look like candy bark however. I’ve been so inspired by all the DIY candy bark I’ve run across lately, the idea had firmly attached itself to the inner cortex of my brain. I’ve seen such creative designs and ideas. So I tweaked my homemade bath melts recipe. And then I tweaked it again. On my fourth try, I finally got it right. And while my cocoa butter & honey homemade bath melts may not look completely like candy bar, they do still resemble candy. More importantly, however, they make it out of the mold in one piece. The other challenge for this project was incorporating the honey into my homemade bath melts recipe. I REALLY wanted to use actual raw honey for this recipe. The problem however, is that honey is aqueous. While cocoa butter, on the other hand, is basically an oil in solid form. Since oil and water don’t mix, I realized I needed to use an emulsifier for this project. It took some doing to figure out the best way to get the two to mix, but I found the perfect solution in the end. You’ll want to use a double boiler to melt the ingredients in this recipe. This will prevent your cocoa butter from becoming grainy. If you don’t have a double boiler, you can use a glass measuring cup in a pan of water. Alternately, you may also melt your ingredients in a microwave at 30% power. 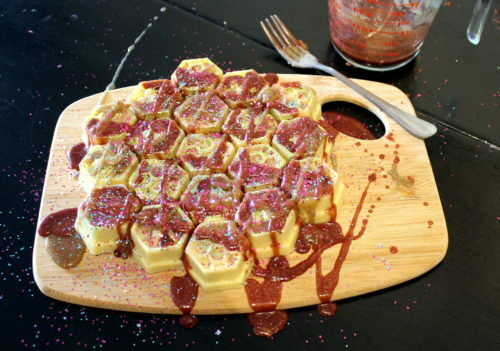 It’s important to emulsify the honey with the other ingredients in this recipe. Otherwise, you’ll end up with honey in the “design” part of the mold. It won’t look pretty and it’s a mess to clean up. If you’ve struggled with honey before, I understand. You can substitute the honey in this homemade bath melts recipe with lanolin for easy sailing. The honey fragrance oil I used for this recipe is crazy strong. Thus I used less than I would with other fragrance oils. If you are easily bothered by strong fragrances, skip this scent and pick a favorite instead. I also recommend cocoa absolute for this recipe with a bit of coffee essential oil blended in. Refined shea butter does make a difference in recipes. As does high melt point shea butter. The melting point of shea butter ranges dramatically. 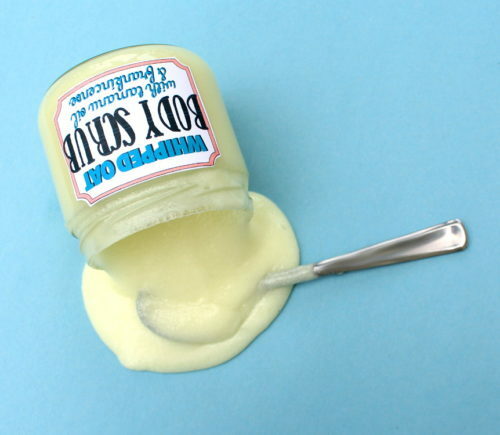 Refined high melt point shea butter has a melting point between 104°F-113°F. While the melting point of unrefined shea butter ranges from 89°F-100°F. Which is why when you make substitutions for refined butter with unrefined butters in your natural skin care recipes, they don’t always perform as expected. Therefore, if you choose to use unrefined shea butter, you’ll want to experiment with bumping up the emulsifying wax to get the perfect fit. Because this homemade bath melts recipe is designed to melt in warm bath water, it has a low melting point. Therefore I recommend making this recipe during the winter months. Outside of this, I do not recommend trying this project unless you are able to store them in a climate controlled location of 75°F or less. You don’t have to use a clear melt and pour soap base for the honey drizzle on your cocoa butter & honey homemade bath melts. Try using a white melt and pour soap base instead for higher contrast and to make it look more like icing. I highly recommend reading through the instructions for my homemade bath melts before you begin. Once you have all your materials, begin by weighing out the cocoa butter and high melt point shea butter. Place the cocoa butter and shea butter in a double boiler and heat until melted over medium-low heat. In the meantime, also weigh out the emulsifying wax and honey. Heat separately, using the double boiler method, over medium-low heat until melted. Stir to combine. Once the cocoa/shea butter and the separate honey and emulsifying wax mixture have both melted, remove from heat. Briefly mix the honey and emulsifying wax for about a minute using an immersion blender. Now combine the melted cocoa/shea butter with the honey and emulsifying wax mixture. Mix together with an immersion blender for 1-2 minutes. Place the mold onto a cutting board or similar. Then pour the homemade bath melts mixture into the mold. Carefully transport the mold to your freezer, using the cutting board to support the mold. If desired, you can brush additional glitter onto your bath melts. 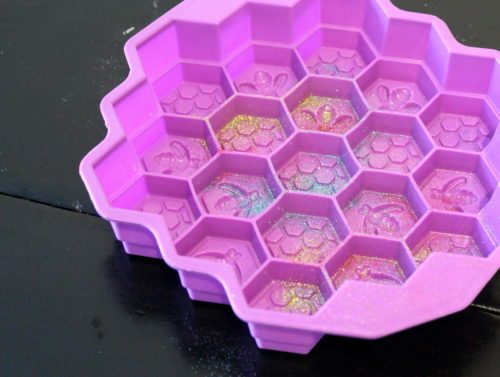 Glitter can also be used to cover any imperfections where small pieces may not have come out of the mold cleanly. 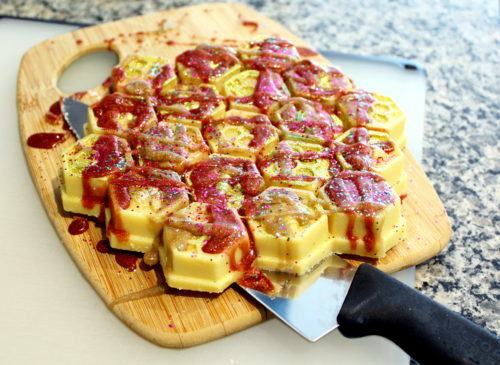 Once you’ve removed the homemade bath melts from the freezer, you can make the honey drizzle for the decoration. You’ll want to pour this onto your homemade bath melts while they are still cold. This way, the warm melt and pour soap base won’t melt your bath melts prematurely. 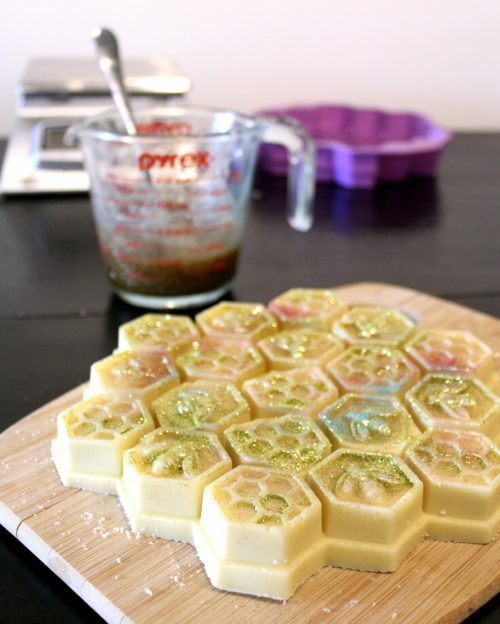 To make the honey drizzle, weigh out the shea butter and melt and pour soap base. Combine in a glass measuring cup. Then heat in the microwave (or in a double boiler) at 30% power until melted. 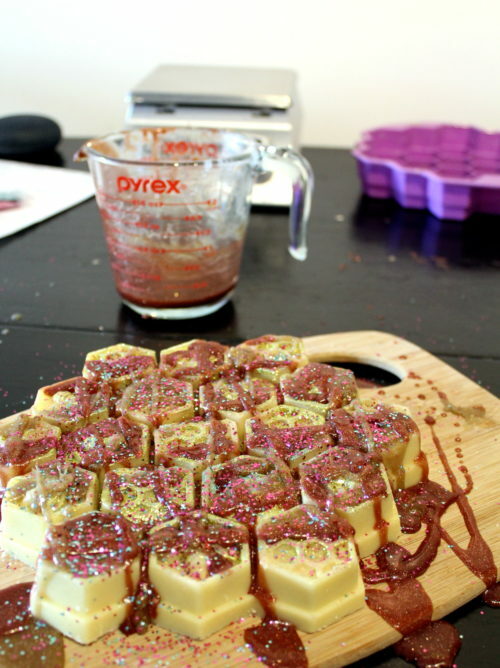 Add a small chunk for a sparkle color bar (alternately you can use mica) to the melted soap base. (I used a brown sparkle color bar for this step.) If desired, you may also stir in some additional glitter. I added a bit of biodegradable gold glitter to mine. Mix well to combine. Once the soap base cools slightly, pour the base across the DIY candy bark homemade bath melts as desired. Then dust chunky biodegradable glitter into the melted soap. I used chunky bubblegum and chunky turquoise glitters for this step. You can then repeat the process in the opposite direction using a different color. My second pass across my bath melts, I mixed a small chunk from a crimson sparkle color bar into my container with the melted soap base. I reheated the soap base slightly first, then mixed in the color. Once the new color was completely combined into the soap base, I then poured the soap across the first pass at a different angle. I followed with more chunky glitter. Once the soap base I’d poured on my homemade bath melts had solidified, I then used a Chef’s knife to remove the bath melts from the cutting board. You’re DIY candy bark homemade bath melts are now ready to be packaged as desired for personal use or gifting. To use your homemade bath melts, simply break off the desired amount and add to warm running bath water. 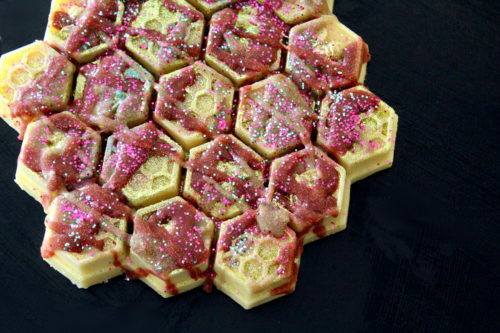 You can use the remaining soap base leftover from the honey drizzle to create solid sugar scrub bars. Simply remelt the soap base, then stir in sugar. I recommend using just enough to thicken the melt soap base, but not so much that it doesn’t still pour smoothly. Then simply pour the remaining base into individual cavities of the mold. Allow to harden, then remove. To use your solid sugar scrub bars, simply massage onto damp skin the bath or shower, then rinse off. If you enjoyed my DIY candy bark homemade bath melts recipe, then you may also enjoy some of my other homemade bath recipes. Following are my other homemade bath melts recipes as well as a few DIY’s for making DIY solid sugar scrubs. Now that you’ve made your own homemade bath melts, learn how to make more great giftable bath, beauty and soap recipes! Sign up for my semi-weekly newsletter to receive updates when new recipes are available. You can also follow me on Pinterest, facebook and instagram. This simple plantain salve recipe is naturally scented with a lovely cocoa mint fragrance. Lovingly crafted with ingredients like roasted cocoa butter and plantain herbal oil, this natural herbal salve is a must for your herbal apothecary. Use this multi-functional, natural skin care product on eczema prone or dry skin, minor cuts and scratches or as a natural lip balm for seasonal winter skin care. When I was a little girl I used to pick the leaves from weeds to make play salads for my parents. What I didn’t realize then was that those leaves I picked were actually edible! It wasn’t until many years later, long after I stopped making dirt pots and grass dolls, that I discovered that the weed I was so fond of, was actually an herb. That herb was plantain. 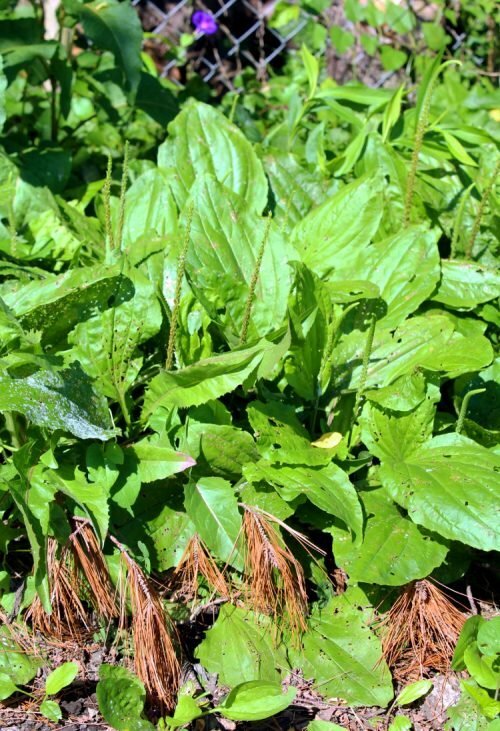 Plantain is a common broad-leaf herb commonly mistaken for a weed. This healthy, hardy plant can be found in backyards across North America and is nutritionally similar to dandelion leaves. Used medicinally by cultures around the world, plantain is a common herbal home remedy for both nutritional and topical skin care applications. You don’t have to eat plantain leaves to enjoy their nutritional benefits, however. You can also get herbal support through tinctures for cleansing & detox. Or enjoy a natural herbal tea made using organic dried plantain leaves. 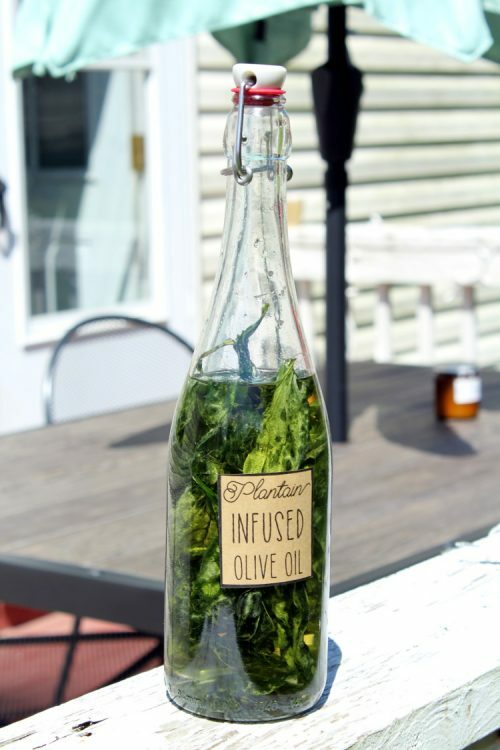 In addition to nutritional support, plantain leaves are also lovely when infused in a carrier oil for topical skin care applications. There are a number of natural skin care products that would benefit from the inclusion of plantain herbal oil. These products include after sun moisturizers, burn relief balms, creams or lotions for eczema or dry skin, and anti-itch salves for insect and spider bites. Dr. Christopher’s Stings and Bites, for example, is a top selling plantain ointment. 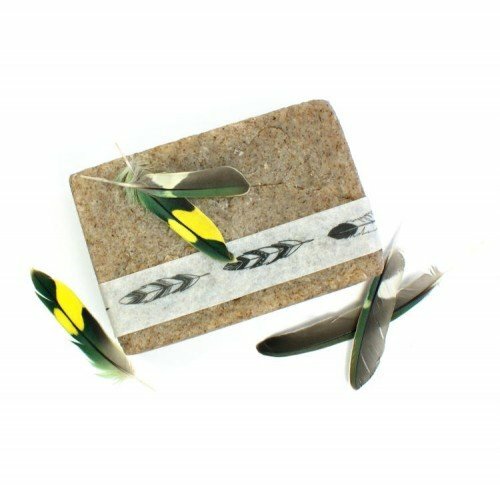 It’s crafted with natural herb constituents like plantain leaf, extra virgin olive oil and beeswax to reduce and relieve the pain, swelling and itching caused by insect stings and bites. To learn more about medicinal plants and herbs, be sure to check out the book, Making Plant Medicine, by Richo Chec. 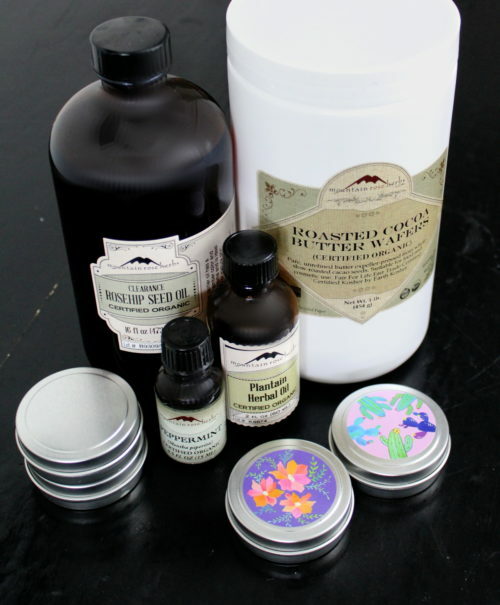 Mountain Rose Herbs has a new roasted cocoa butter available that I really wanted to try. So I was really pleased when it arrived at my doorstep last week. This stuff smells amazing. I love that it’s suited for both food and cosmetic use. As it smells so wonderful, however, I really wanted to create a product that would highlight the natural scent of the roasted cocoa butter. I also knew I wanted something to create a natural skin care product that would be suitable for seasonal skin care and gift giving. Therefore, in the end, I opted for crafting a simple plantain salve recipe with a cocoa mint scent. I love the simplicity of my natural plantain salve recipe. It’s formulated using just five simple ingredients – roasted cocoa butter, plantain herbal oil, beeswax, rosehip seed oil and peppermint essential oil. The cocoa mint scent, of course, is naturally derived from the inclusion of the organic peppermint essential oil and roasted cocoa butter. The roasted cocoa butter wafers from Mountain Rose Herbs aren’t deodorized. Therefore they retain their natural cocoa scent. Expeller pressed from the roasted seeds of the cocoa tree, these cocoa butter wafers are naturally rich in vitamin E. They can be combined with cocoa powder to make chocolate, but also make a nice addition to recipes for lip balms, body butters, homemade soaps and salves. While plantain herbal oil is easy to make, you can also enjoy the convenience of buying pre-made plantain herbal oil. This is especially helpful if you’re wanting to make natural skin care products using plantain herbal oil right away. Or if plantain is out of season throughout the cold winter months. 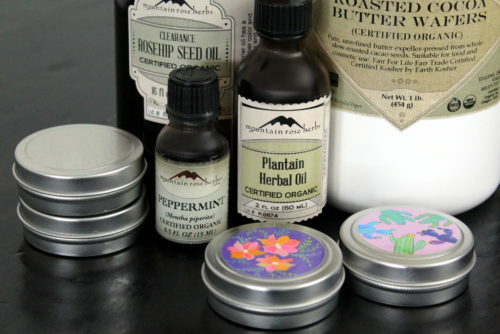 I used plantain herbal oil from Mountain Rose Herbs for my simple plantain salve recipe. An emollient oil formulated using solar infused plantain olive oil and vitamin E, this herbal plantain oil is especially nourishing for dry hands and skin. Crafted with certified organic Plantago major leaves, this natural herbal oil is perfect for gardeners, wild harvesters, climbers – or anyone else who works with their hands frequently. I also like to use this herbal oil, as is, on my dog’s minor cuts and irritation for a simple and safe natural remedy for his skin. As I have both maturing skin, as well as skin that tends to dry out more in the winter, I also used rosehip seed oil for my plantain salve recipe. While this may shorten the shelf life of your salve somewhat, I highly recommend this unique carrier oil for its essential fatty acids. Popular in natural anti-aging skin care recipes, rosehip seed oil offers marvelous hydration for dry skin and a quick absorption rate. It can also be used solo as a natural daily facial cleanser or hydrating oil. A key ingredient in homemade salve recipes, beeswax gives this plantain salve recipe its thick, rich texture. It also acts as a natural skin protectant while still allowing skin to breathe. In addition to its skin protectant properties, beeswax is also a humectant (meaning it attracts water to hydrate skin) and helps to temporarily reduce and soothe itching. 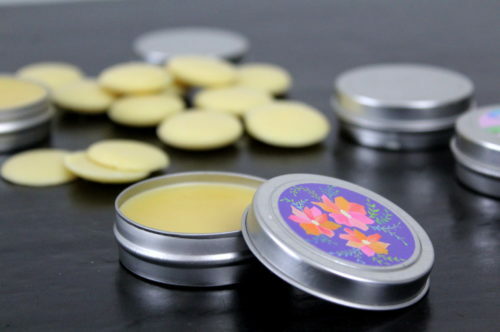 The beeswax pastilles from Mountain Rose Herbs have a deep, golden color and aroma. Globally sourced from less-developed countries like South America and Africa, their beeswax helps sustain the local economy of these areas while using traditional (less-modern) processing techniques. 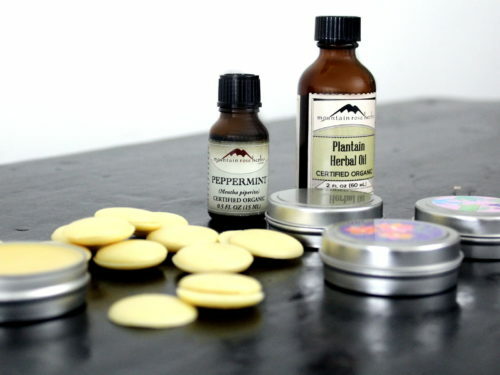 A sweet, candy-like scented peppermint, the organic peppermint oil from Mountain Rose Herbs helps bump my simple plantain salve recipe into peppermint patty like status. This naturally steam distilled, certified organic essential oil has a fresh, very minty, hot, herbaceous fragrance with a vegetative back note. Perfect for all types of recipes including cleaning sprays, perfumes, aroma mists and natural skin care, this is a truly aromatic essential oil. Peppermint essential oils is commonly included in natural skincare recipes and homemade salves and balms for topical pain relief, its anti-itch properties and the cooling sensation. It also supports circulation and can calm acne inflammation. Ready to learn how to make a plantain salve? You’ll find my simple and easy plantain salve recipe below. 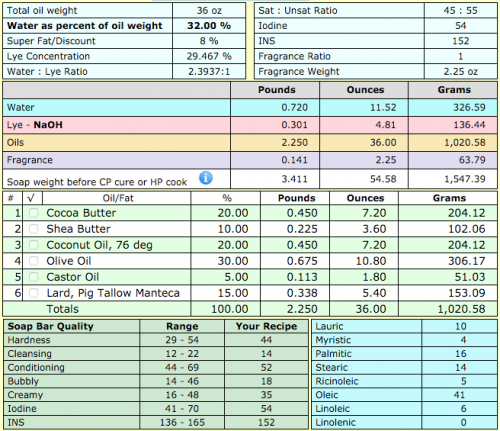 You will need a digital scale to weigh out the ingredients for my plantain salve recipe. In addition you’ll also need a one or two cup heat safe glass measuring cup (such as Pyrex) and a utensil to stir your salve. I typically use a fork. You’ll also need containers for your plantain herbal salve. I used 1 oz. metal tins with rolled edge covers. Once you’ve gathered the ingredients and supplies you’ll need, you’re ready to begin. Start by weighing out the roasted cocoa butter wafers and beeswax. Combine in a heat safe glass container. Then heat either on the stove top using the double boiler method or in your microwave at 30% power until halfway melted. Next, weigh out the rosehip seed oil and the plantain herbal oil. 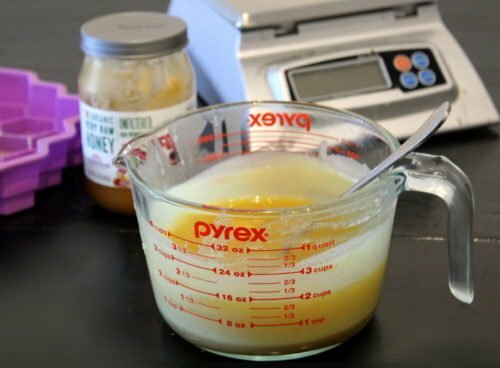 Add these ingredients to the same container as the cocoa butter and beeswax. Continue gently heating the ingredients until all of the ingredients for the plantain salve recipe have completely melted. Once melted, remove the plantain salve mixture from heat and stir to combine. Then stir in 20 drops of organic peppermint essential oils. Now pour your plantain herbal salve evenly into five 1 oz. tins. Allow the salve to cool completely then pop on the lids and it’s ready to go. To use, simply apply to affected area as desired and massage in. 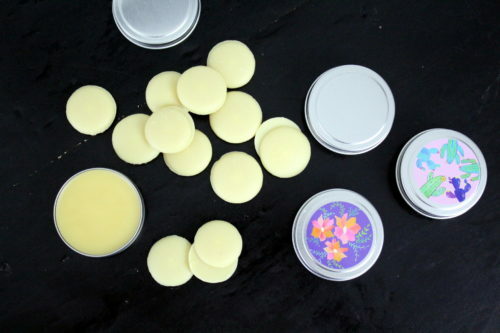 You can also keep my plantain salve tucked inside your purse to use a natural cocoa mint lip balm throughout the year. If desired, you can decorate the lids of your tins. 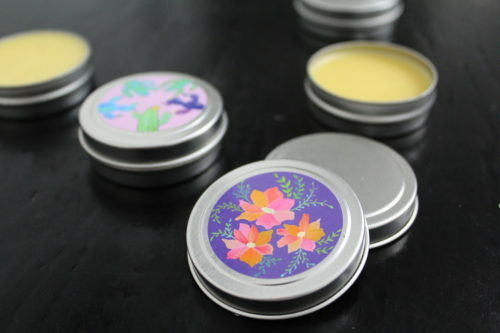 I used nature stickers from Art By Sharell to decorate the lids of my plantain salve containers. However, washi tape also makes a fun addition and makes a simple, yet pretty package decorating idea. Should you wish to sell the products you make from my plantain salve recipe, there is important information that you need to know if you live in the United States. Not only do you need to follow all FDA guidelines for labeling your products, you’ll also need to refrain from making any medical claims in regards to said product. It can all be very confusing. However, Marie Gale has a great book, titled Soap and Cosmetic Labeling, that can help steer you in the right direction. If you love my simple plantain salve recipe as much as I do, then I encourage you to give these other natural skin care recipes a try. 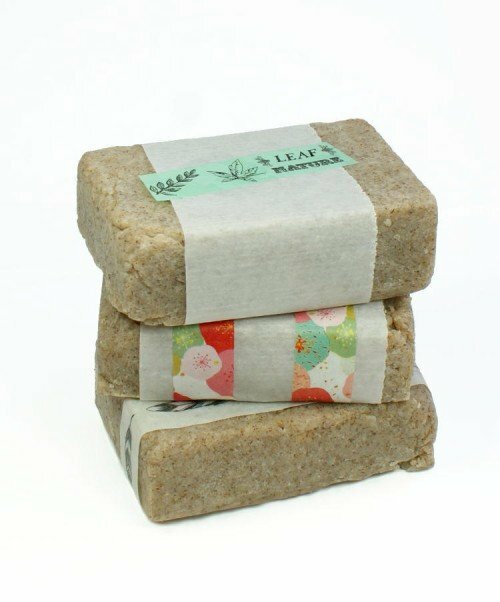 Each one is made using plantain herbal oil for nourishing natural skin care that you can make and gift. For more great natural skin care and herbal salve recipes, as well as updates from Soap Deli News blog, be sure to follow me across all of your favorite social media platforms. You can find me on G+, Pinterest, Facebook, Twitter, Blog Lovin’ and Instagram. Alternately, you can also subscribe to Soap Deli News via email for future updates, DIY projects and recipes. 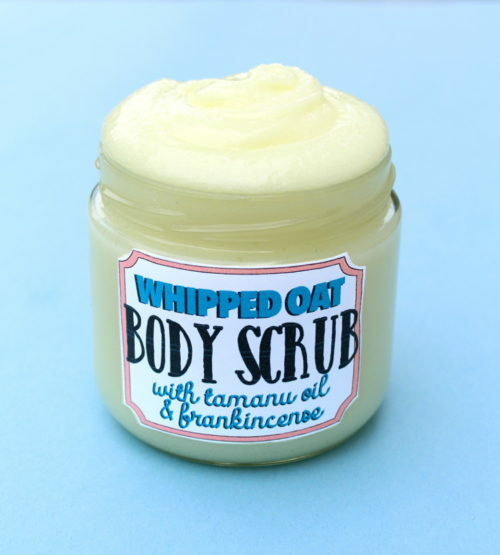 This foaming oat body scrub recipe is homemade with skin soothing oat butter, tamanu oil and frankincense essential oil. Both frankincense and tamanu oil are purported to have anti-aging skin care properties and are therefore used in a variety of products that help to diminish the appearance of fine lines and wrinkles. Tamanu oil specifically possesses a variety of properties useful in skin care applications. It is a powerful anti-inflammatory, antimicrobial, antifungal, antibacterial and analgesic carrier oil. Additionally tamanu oil is also rich in antioxidants and is a wonderful moisturizer. Because of this, tamanu oil has been traditionally used as a natural home remedy to promote the healing of minor wounds and abrasions, insect bites and sunburns. It’s also beneficial in relieving bothersome skin conditions such as acne, psoriasis, dry or scaly skin, and eczema. My foaming oat body scrub recipe is suitable for all skin types, including normal and oily skin. As it contains a foaming bath whip, it can be used to exfoliate and cleanse skin in place of your usual soap or body wash. This body scrub is perfect for those who prefer a product that rinses away completely after use rather than leaving beneficial oils behind. This makes it a great body scrub option for summer when skin tends to sweat and produce more oils. 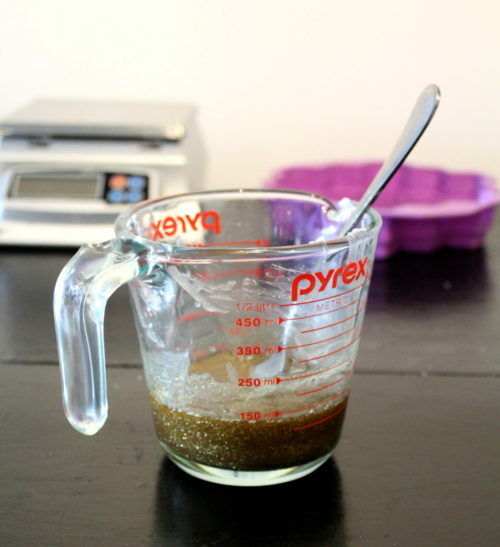 You will need a digital scale to weigh all of the ingredients for my foaming oat body scrub recipe. Being by weighing out the cocoa butter and emulsifying wax. Combine in a large 8 cup glass Pyrex measuring cup or glass bowl. Heat the wax and cocoa butter in the microwave at 40% power until melted. Alternately you may also use a double boiler. Remove the melted ingredients from heat then weigh out the oat butter. Stir the oat butter into the melted ingredients until it has fully melted. 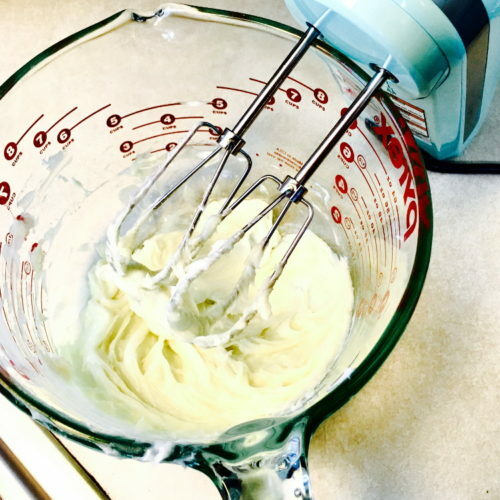 Follow with the foaming bath whip, then mix with a power hand blender for about 2 minutes. Weigh out the frankincense essential oil and mix into the ingredients using a hand blender. Once all of the wet ingredients are thoroughly combined you can add the sugar. Slowly add the sugar mixing with a hand blender until all of the sugar is evenly distributed throughout. When the sugar is well incorporated into your oat body scrub, you are ready to pour the scrub into containers. 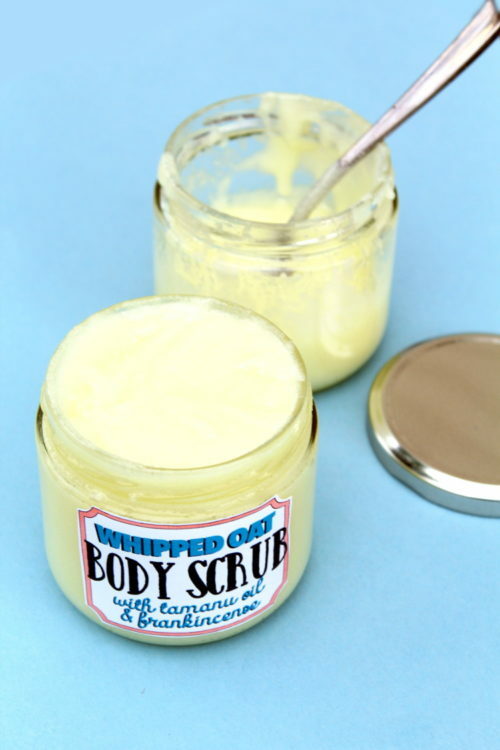 Allow your body scrub to fully cool, then screw on the lug caps and label as desired for gifting or personal use. 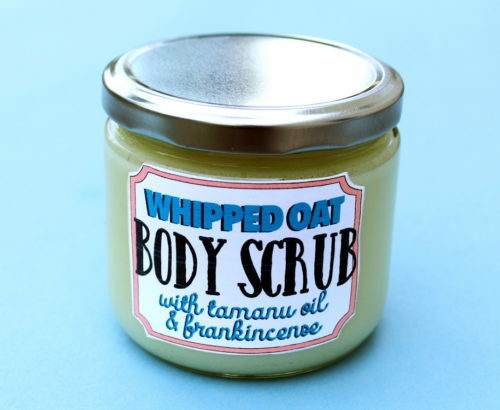 If you’d like to sell the scrubs you create using my foaming oat body scrub recipe, then you’ll need to label your product so that it meets FDA guidelines. If you’re unsure about the rules and regulations regarding labeling, I highly recommend the book, Soap and Cosmetic Labeling: How to Follow the Rules and Regs Explained in Plain English, by Marie Gale. For even more of my homemade body scrub recipes, visit Soap Deli News blog here. You can also find more great body scrub and skin care recipes on my Pinterest boards here. Don’t want to miss a post? You can also find and follow me on G+, Tumblr, Facebook, Twitter, Blog Lovin’, and Instagram. Or sign up to receive new posts directly to your email via FeedBurner. 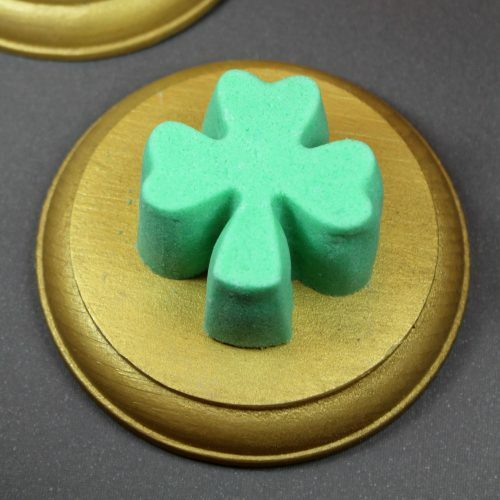 Learn how to make this fizzing shamrock bath truffles recipe for St. Patrick’s Day! This easy fizzing shamrock bath truffles recipe creates a fizzy bath truffle that adds moisturizing cocoa butter to your bath water along with bubbles. While it doesn’t have the dramatic effect of a bath bomb, it’s perfect for those who prefer less flair in their bath water. 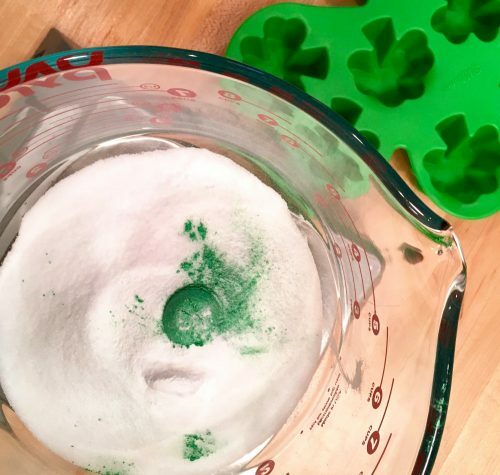 You’ll also find that my fizzing shamrock bath truffles recipe creates a product that’s easy to remove from a silicone mold – so your fizzy bath truffles come out all in one piece! Made with skin nourishing cocoa butter, my fizzing shamrock bath truffles recipe also contain dendritic salt, which has better oil absorption, greater fragrance retention and dissolves faster in water than regular salt. Ready to get started? Follow my recipe and instructions below! 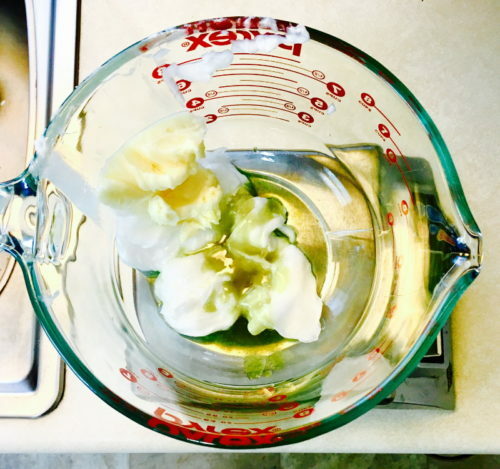 You will need a digital scale for my fizzing shamrock bath truffles recipe in order to weigh the ingredients. 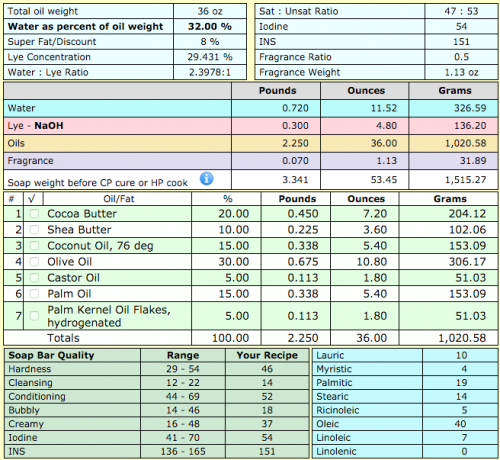 (I recommend this Baker’s Math Scale if you plan to make a lot of bath, body or soap recipes.) You will also need the Wilton 8-Cavity Silicone Shamrock Mold which can be found online and in most craft stores. Begin by weighing out the cocoa butter in either a double boiler or a glass Pyrex container. Heat the cocoa butter in your double boiler or in a heat safe glass container in the microwave at 50% power until melted. 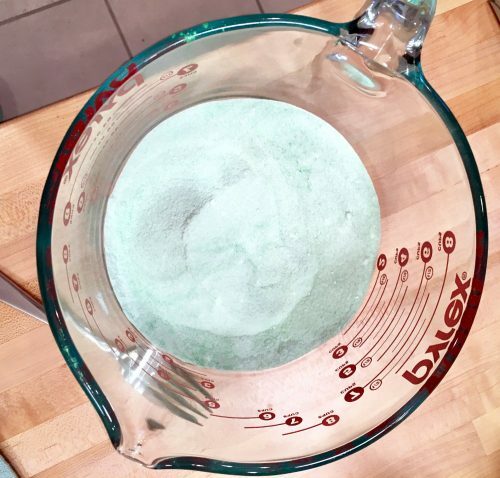 Using a teaspoon measure, measure out the green mica and add to the other dry ingredients. Now mix the dry ingredients thoroughly together. Next, weigh out the essential oil and stir into the melted cocoa butter. You can now begin filling five of the cavities of your shamrock silicone mold. To do this, I recommend filling one cavity at a time. Loosely add the fizzing bath truffles mix to fill one cavity. Then pile more on top to form a mountain. Next, firmly press the ingredients into the mold cavity. Resist pushing so hard that the cavity bows out on the sides, but enough that the mixture is firmly packed. 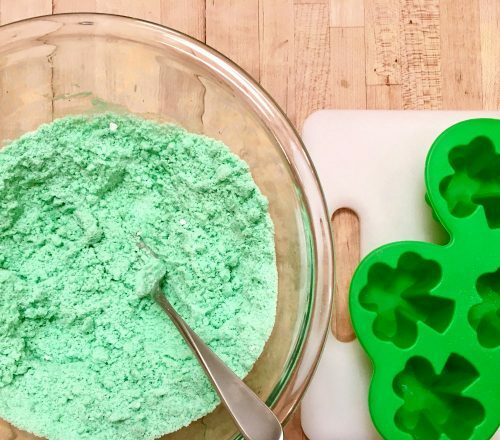 Proceed with filling four additional cavities of your shamrock mold. Once you’ve filled the mold, set the molded fizzing bath bomb truffles aside out of the way in a dry location. 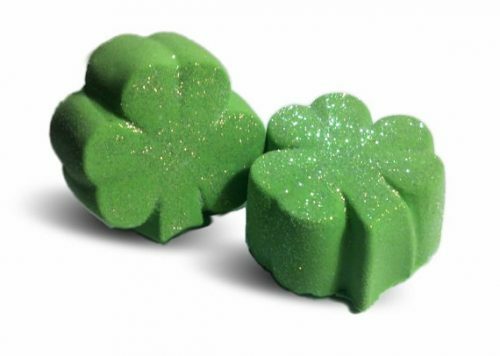 Wait two days, then carefully unmold your fizzing shamrock bath truffles. Wrap and label your completed fizzing bath truffles as desired for personal use or for gifting. To use, simply add to warm, running bath water and enjoy! My fizzing shamrock bath truffles don’t have the same flair as bath bombs however they do create bubbles and fill your bath with nourishing cocoa butter. These are perfect for people that don’t want super colored bathwater and strong fragrances. If you plan to sell your fizzing shamrock bath truffles, you’ll need to follow FDA guidelines for labeling your product. If you’re unsure about the rules and regulations regarding labeling cosmetics, I highly recommend the book, Soap and Cosmetic Labeling: How to Follow the Rules and Regs Explained in Plain English, by Marie Gale. It is important to note that, as this product contains SLSA, it is considered a foaming detergent bath product. As such labeling requires an additional caution to be printed on the label unless it states that the product is for adult use only. This is in addition to the ingredient list and directions for use and other information required for cosmetic labeling. 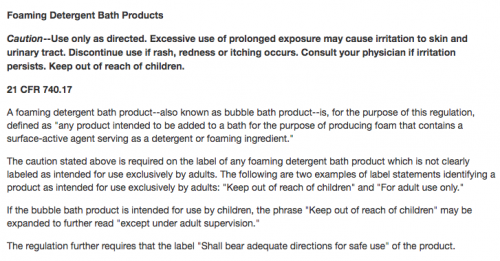 Above is a screenshot of this requirement from the FDA website for cosmetic labeling regulations regarding this product. Be sure to use your fizzy bath truffles within a few months for best results as citric acid begins to lose its potency once exposed to air. In addition I also received some helpful tips for making bath bombs on one of my instagram posts! The Bubbling Mermaid suggests when formulating your own bath bombs or bath fizzies for use in a silicone mold that you add kaolin clay for ease of removal. While The Chequered Lily also recommends curing your bath fizzies in a silicone mold for at least 48 hours. 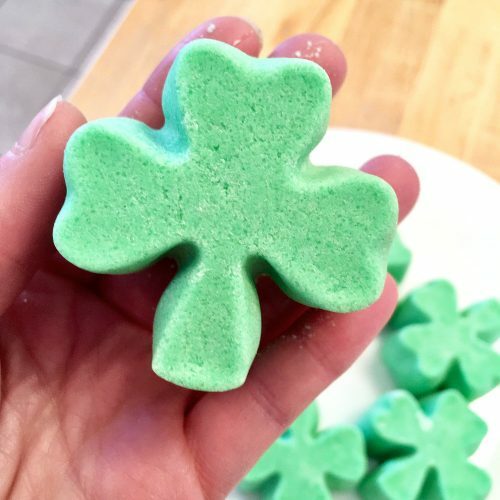 If you don’t have the time to create my fizzing shamrock bath truffles recipe you can find similar handmade products on Etsy like this set of two magic bath bomb shamrocks from SpaGlo. 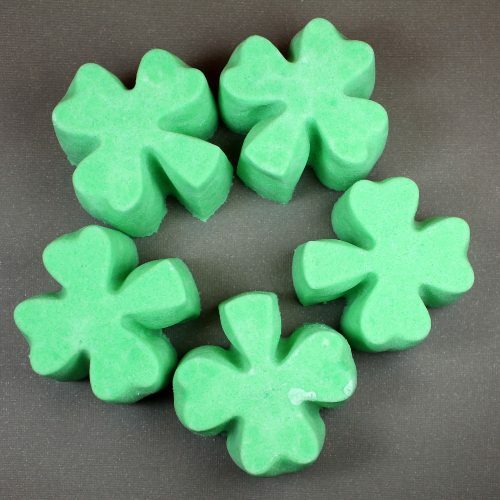 Or you can browse for more shamrock bath bombs here. 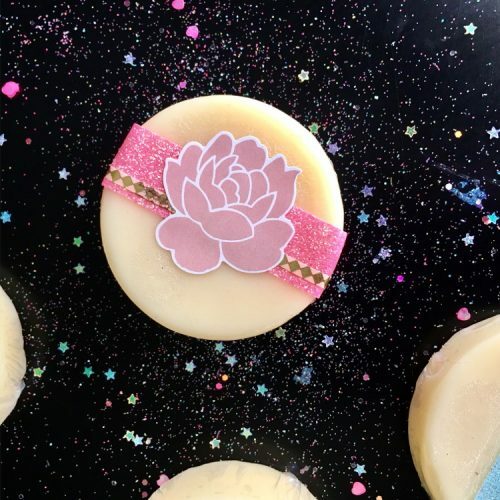 For more recipes like my fizzing bath truffles recipe as well as other homemade bath and body and soap recipes, be sure to check out my DIY Bath and Body board on Pinterest. You can also find me on G+, Tumblr, Facebook, Twitter, Blog Lovin’, and Instagram. Or sign up to receive new posts to your email via FeedBurner so you never miss a post. My son, like me, suffers from dry skin in the winter and asked if I could make him a really moisturizing soap for his skin. In the end I settled on a high conditioning/low cleansing double butter soap recipe made with 20% cocoa butter, 10% shea butter, and an 8% superfat. I also added corn silk powder to my recipe for it’s gentle exfoliating properties and a silky feel. And, to help curb potential skin issues, I also included a small amount of neem oil in the recipe as well. My son’s other request for this homemade soap was that it make him “smell like a man.” So I scented it with a mahogany teakwood fragrance oil. Fragrance however, is optional, and you can either leave this double butter soap recipe unscented when you make yours or use a fragrance oil of your choice instead. Before you get started on my luxury double butter soap recipe, there are a few things you should know. One, this soap recipe is NOT recommended for beginners. This soap moves really quickly and there’s a good chance it can and will seize up on you. Therefore you should soap at as low a temperature as possible and you may want to mix this one by hand. 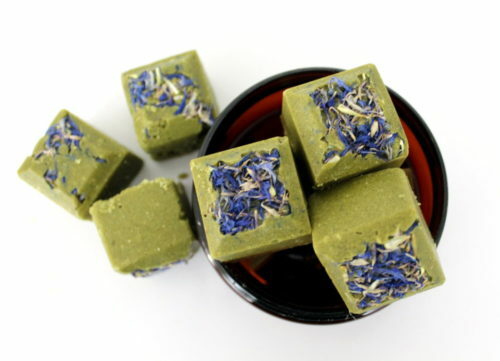 Should you use a stick blender, be prepared for this soap to basically act like you’re making it using the hot process soapmaking method should it seize. If and when it does seize on you, simply wait for it to gel. (It will look translucent when it does this.) Then continue mixing if needed and pour (spoon) into your mold at this point. You can also wait for it to hit gel stage if you like before adding your fragrance. Unlike hot process soap however, you won’t need to add heat once you mix the oils, butter and lye-water as it’s going to heat up on its own and do all the work for you. Both of these luxury double butter soap recipes will fit into one of my DIY wooden loaf soap molds and will yield approximately 10-12 bars depending on how thick you cut them. You’ll need to follow my basic cold process soapmaking method instructions when making this homemade soap. 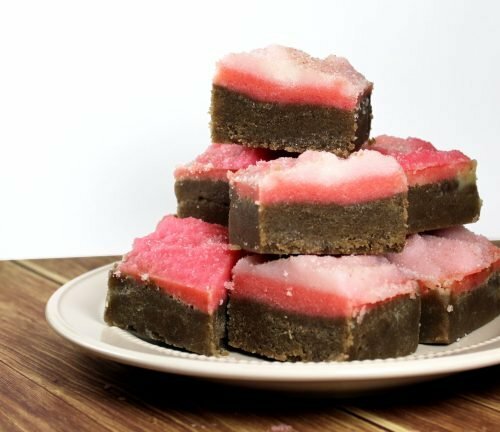 (If you’ve never made cold process soap before here’s a good, inexpensive beginner’s cold process soap recipe to get you started. This is not a good soap recipe for beginner soapmakers.) Be sure to take all proper safety precautions when working with lye including goggles and gloves. Choose the double butter soap recipe you’d like to make, then begin by measuring out the distilled water in fluid ounces. Pour into a heat safe pitcher. Next, use a digital scale to weigh out the lye. Slowly pour the lye into the water in a well ventilated area and stir until all the lye has dissolved. Set aside to cool. 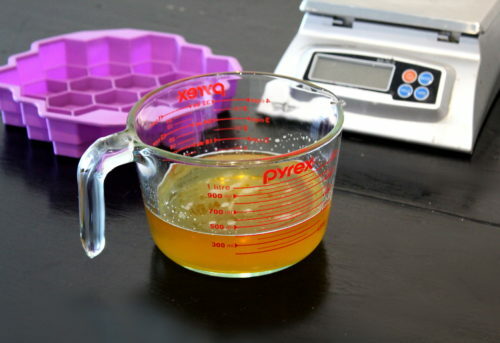 Now weigh out the soapmaking oils using your digital scale and combine in a stainless steel pot. Heat until all the oils have melted, then remove from heat and set aside to cool. When the lye-water and soapmaking oils have cooled to 85°F to 90°F – or room temp if it’s within your experience and comfort level – you’re ready to make soap. 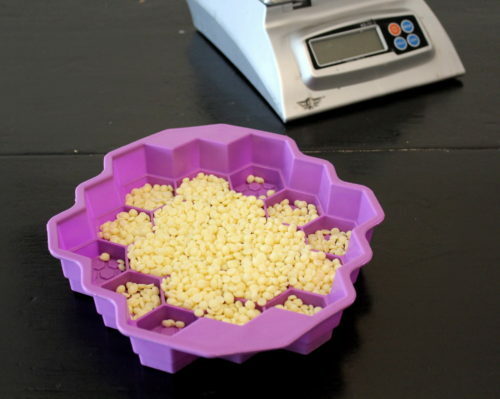 Start by measuring out the corn silk powder with a measuring spoon and add to your melted soapmaking oils. Use a stick blender to combine until the soapmaking oils are free of clumps and the corn silk powder has been evenly distributed. As there’s the likelihood this soap may potentially seize, you may want to weigh out the fragrance oil and add it at this time as well rather than waiting til trace. Alternately, it can be added after the soap gels. Next, slowly pour the lye-water into the soapmaking oils. Mix with a stick blender until you reach trace. If the soap seizes, be patient. 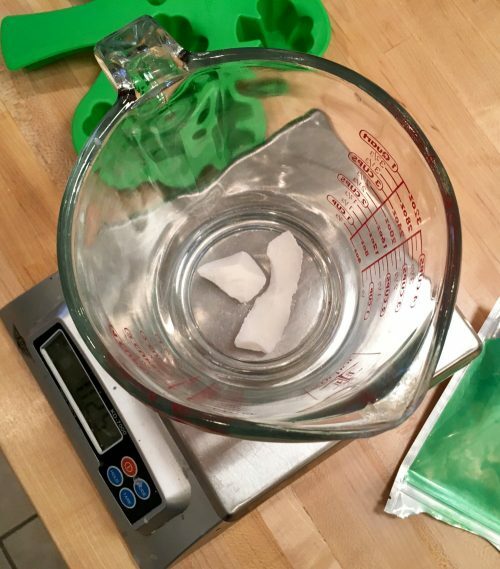 Wait for the soap to gel, then mix again and pour (or spoon) into your mold. Leave the soap uncovered overnight. You should be able to unmold your soap the next day. 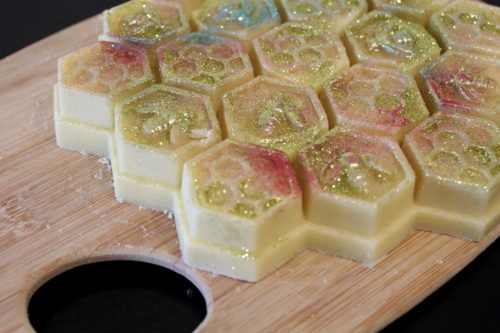 Once you’ve removed your soap from the mold, cut into bars then allow to cure 4-6 weeks before use. 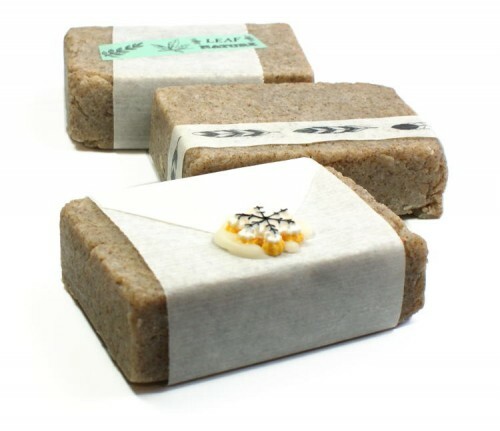 Want to learn how to create your own custom cold process soap recipes using a lye calculator? See my tutorial on creating cold process soap recipes using a lye calculator here. For more of my homemade soap recipes, be sure to follow my Simply Soapmaking and DIY Bath and Body boards on Pinterest. Or keep up with all of my new homemade soap, bath and beauty recipes by following me on Blog Lovin’, Tumblr, Facebook, Twitter, G+ and Instagram.